Each one of the 59 Tomahawk missiles fired by the US Navy at the Syrian air base in Homs cost somewhere between $800,000 and $1.4 million per missile. Tomahawk missiles were a poor choice of weaponry under the circumstances because Russia has S-400 surface to air defence technology in place in Syria which could easily have shot them down. 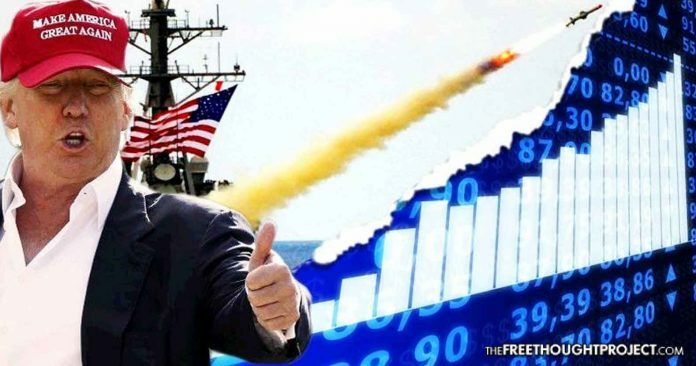 According to the Palmer Reports, Trump has ordered military action which has given direct financial benefit to a company that he may own stock in. Yes, Donald Trump own or have owned stocks in the company that makes Tomahawk. Tomahawk missiles are manufactured by Raytheon.Inc. According to the reports from the Business Insider, Mr Trump owned stock in Raytheon up through at least the start of the presidential election cycle. Also, there is no record that he subsequently sold that stock. On April 6, Raytheon closed at $150.75 and on next morning it opened at $154.62. This shot the company’s market value up from $44.1 billion to $45.4 billion. The Department of Defense asked for $2 billion over five years to buy 4,000 Tomahawks for the U.S. Navy in its fiscal 2017 budget last February. Raytheon’s is the world’s largest producer of guided missiles. It is the major US defence contractor and industrial cooperation with core manufacturing concentrations in weapons.